Tech geeks, Mac geeks and Apple fan boys got busy earlier today as they anticipated the announcement of the new iPhone. The hiatus is now over. 15 months after the iPhone 4, we now have the iPhone 4S. Because it's an 'S,' the design is similar to that of the iPhone 4 but the internals have been drastically improved. 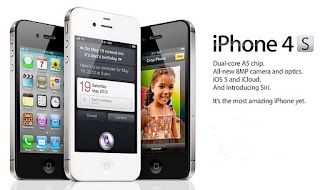 The new iPhone 4S carries the dual core processor A5 chip that the iPad 2 has. Because of the powerful and efficient processor, the graphics is 7 times faster than that of the iPhone 4 (which already had a really good graphics) and the battery life has also been improved. One of the major improvements for this iPhone is the all new and greatly improved 8 megapixel camera. Knowing Apple, they are not just concerned about the number of megapixels. They totally improved the optics. The custom lens now has 5 precision elements to make your image look sharper and allow more light. Add to that the larger aperture (f/2.4) for a brighter picture. It has also an advanced Hybrid Infrared Filter to keep those harmful light (usually sunlight) to destroy your photos, a Face Detection feature, 1080p HD video recording and an Image Stabilization feature (utilizing the phone's gyroscope) to make your videos look still even with your shaky hands. So, what good is your point and shoot digital camera now? Mind you, the sample pictures and video were really mind blowing. Lastly, the most notable and probably what makes this iPhone revolutionary is "Siri." Siri is the iPhone 4S' humble personal talking assistant. You can literally just talk to your iPhone now. It will not only listen. It will understand you. Think of questions or commands like "What time is it in Paris? ", "Remind me to grab my grocery bag when I get home." or "Will it rain today?" Also, when you receive a text and you are on your headset, it will read the message for you. You can reply by just telling Siri what to reply. It can even set appointments for you. The possibilities are endless! All in all, I could say that the iPhone is trying to maintain its status in the smartphone industry. It has revolutionized the way we think about phones and it will continue to be. I respect their decision to go with the 4S instead of the 5 yet. The iPhone 4 was still so perfect. It just needed the spec bump that's why we have the iPhone 4S. It's probably overkill if they go the iPhone 5 route. It would probably be over designing or something like that. I'm just happy that it's getting better and better every year. Way to go, Apple!